Are you holding out on considering spirituality because you figure you have plenty of time for that down the road? A study out of the U.K. says yes. According to a 2011 National Post article, the study suggests the decline of religion in developed nations can be linked, at least in part, to our ever-increasing life expectancy. It causes people to postpone any sort of faith life because they don’t sense any urgency to, as the National Post termed it, “secure a place in heaven”. I can understand this because our culture insists that pursuing fame, saving money for a Caribbean cruise, advancing your career, and even gossiping over the UK royal family are more important than living a life of faith. The way I see it – and this is backed up by conversations with non-Christian family members and friends – most people don’t see any benefit in considering spirituality because they have no concept that it’s about so, SO much more than the afterlife. The media will never tell you this, but Christianity isn’t about religion. It’s about a here-and-now relationship with God, through Jesus, whom serious Christians believe to be His son. Yes, what happens to us when we die is of infinite importance, but to ignore the benefits of knowing God and following Jesus NOW is like buying a cottage and never using it until you retire. I get what Ross is saying. If you have no relationship with God, if you don’t know who He is or have even a vague understand what Jesus has done for everyone who follows Him, then will you get much comfort from a last-minute deathbed “conversion”? In the meantime, what happens if you lose your job or your house burns down or a loved one is hurt in a car accident? Challenges like these happen to everyone, but I’ve found that having a here-and-now relationship with God, through Jesus, makes them easier to bear. For one thing, as a regular church attendee, I’m part of a supportive community that’s based on something so much more important than a shared interest in extreme sports or wine tasting. Here’s something else to ponder: Former Canadian Prime Minister Brian Mulroney infamously spoke about “rolling the dice” during the early 1990s on constitutional negotiations with the country’s 10 provinces. His gamble failed and Canada’s constitution remains unsigned by Quebec. Are you as brave – or as foolish – as Mr. Mulroney? 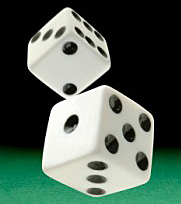 Are you willing to risk “rolling the dice” that nothing will prevent you from sitting in a rocking chair, enjoying retirement and leisurely doing what it takes to “secure a place in heaven”? Post an answer below and let’s have a conversation. This is so true! I love this post. The peace that comes hand in hand with knowing God for yourself is worth so much! I pray that there will be many who read this and realize what salvation is truly about! Great post!